Nestled into the south eastern corner of Botswana, spitting distance from Zimbabwe, lies the mopani wooded Tuli Block. The area is characterized by red sandstone ridges, snaking riverbeds lined with towering lead wood and apple leaf trees and a night sky like something out of a mythical story. 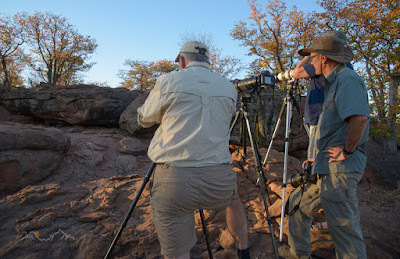 This was the setting of the 'Romancing The Trees' Tuli wilderness photography workshop. Tuli is a long way from anywhere it turns out. It's possible to get there after flying in to Polokwane, but for most people, getting to the Tuli Block is usually done by driving from Johannesburg. To this end I met up with three photographers from the UK at OR Tambo airport, before trundling the long road north together. By long, be prepared to be in a vehicle for a good seven hours. Still, we managed to cross into Botswana at Pont Drift border post and work our way past Mashatu Reserve to Tuli Wilderness Safaris which would be the staging area for the bulk of the workshop. An excellent and luxurious staging it is! Several years ago I ventured into the Tuli Wilderness under the auspices of African Impact, a volunteer travel company that I did a lot of work for at the time. I always felt that I would need to come back at some stage. Thankfully Nature's Light created that opportunity, so back I was with three British photographers chasing the light for what we billed as a 'wilderness photography workshop'. Part landscape, part wildlife, the workshop was to take in 6 nights in the Tuli Block along with - as per special request on the guests’ part - 2 nights on the iconic Kubu Island on the edge of Botswana's Soa Pan. The first day of the workshop proper whirled by with elephant, eland, kudu and every other antelope that the Tuli could offer up. We used it more as an orientation to the area, exploring a large swathe of the 12000 odd hectares that Tuli Wilderness Safaris have to offer. We finished off the day on the Motloutse River playing with the light against the red rock of Solomon's Wall. This imposing rock feature appears like a man-made wall almost, with a gap where millennia of flowing water have a cut between the rock wall to allow the Motloutse to flow unhindered (when it actually flows that is). The workshop is aptly named, "Romancing the Trees". The Tuli block was covered in a burnished bronze of winter-clad mopani trees. In summer they turn to a pale sea of green that glows when the sun shines through the butterfly shaped leaves. Dotted around are the equally iconic Shepard trees, as well as the occasional Baobab. It was with the Shepard trees that we played at night, creating star trails and astrophotography landscapes. The Mopani trees became subjects by day, glowing orange and yellow as the sun rose or fell on the horizon. The pale greens and yellows in particular contrasted beautifully with the rust coloured sands along small dry riverbanks. Despite my predilection to landscape and affinity to the trees of the Tuli Block, the workshop was billed as a 'wilderness photography workshop'. 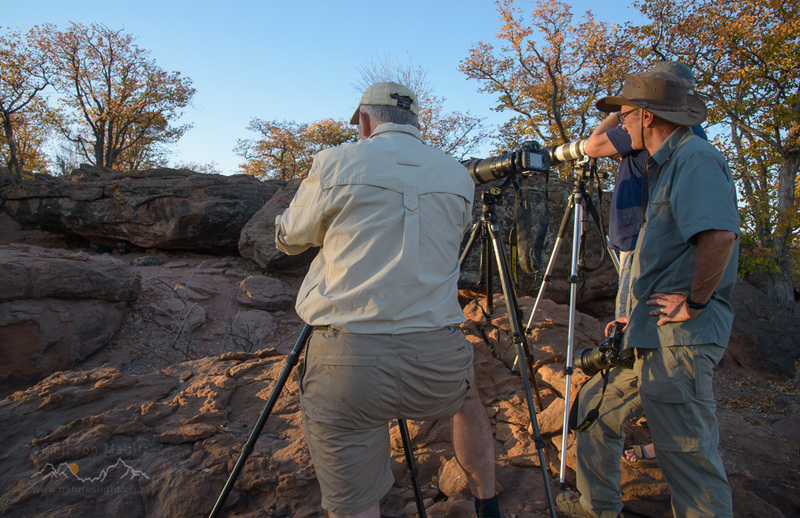 There was plenty of wildlife to photograph as alongside the trees and rocks of the Tuli. A particular highlight was visiting a secluded Hyena den on the edge of the property; a small pack of Spotted Hyena seem unfazed as human visitors are allowed to enter their space, quietly watching as the hyena pups roll and tussle with each other. This was a truly exceptional experience and definitely one of the highlights mentioned by all the photographers who joined the workshop. 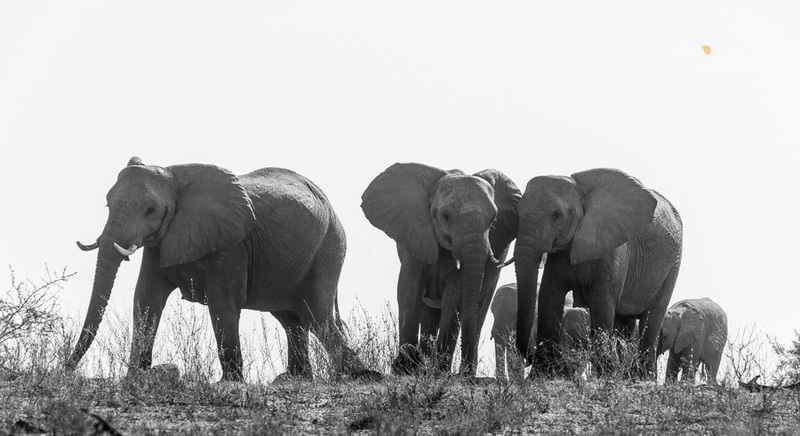 We also had the usual encounters with elephants, whose presence is clearly evident in virtually every inch of the Tuli Block. Large areas of mopani are short-cropped by the constant foraging of the elephant herds (an elephant requires up to 300kg of forage a day - 75kg dry weight). Then it is almost impossible to look down at the ground and not see an elephant track within your immediate area. Elephant are profligate beyond belief in the Tuli. Another highlight was the evenings spent photographing the night sky. We spent several nights shooting both star trail and Milky Way images. The clarity of the sky at night was utterly phenomenal. The night sky appears mind-bogglingly vast as you look up at the panoply of stars. 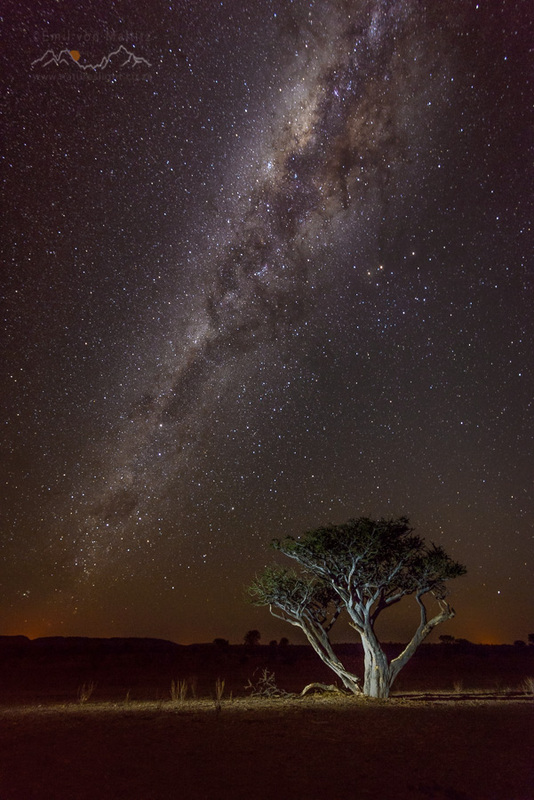 The Milky Way is a shimmering river of light as it stretches from horizon to horizon. Our tiny insignificance is driven home as you stare up at the twinkling lights. Bringing us down to earth again is the surprising realization that even this far north, and away from any major city, light pollution was still visible in the images we created. A small orange glow marked the position of a De Beers mine in South Africa and a second smaller glow, Lentswelemoriti, a village on the Botswanan side of the border. 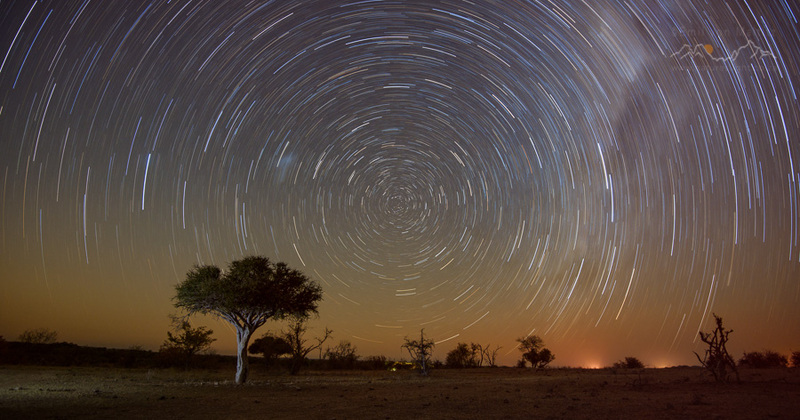 Something that the Tuli, and indeed much of Botswana, lends itself to photographically is panoramic landscapes. The vast open landscape and cloudless skies make for excellent sweeping vistas that draw the viewer in. For this reason we spent quite some time looking at the possibilities of using Lightroom and Photoshop to create stitched panoramic images. The newer Lightroom CC is truly excellent at this and has all but replaced my traditional preferred application, PTGui (this one seems to be reserved for the really complex multi-row panoramics that I occasionally create). One of the best new features of the current Lightroom iteration is that there is now a ‘warp’ feature which fills and straightens a multi-image panoramic stitch - something one used to have to do in Photoshop manually. The ‘warp’ may not be perfect yet, but it certainly speeds up workflow and makes decent panoramic that much easier. It was this style of photography that dominated when we visited the Great Wall of Tuli. This bizarre rock feature looks almost as if a giant has carefully dry-walled a section of the Tuli block off. 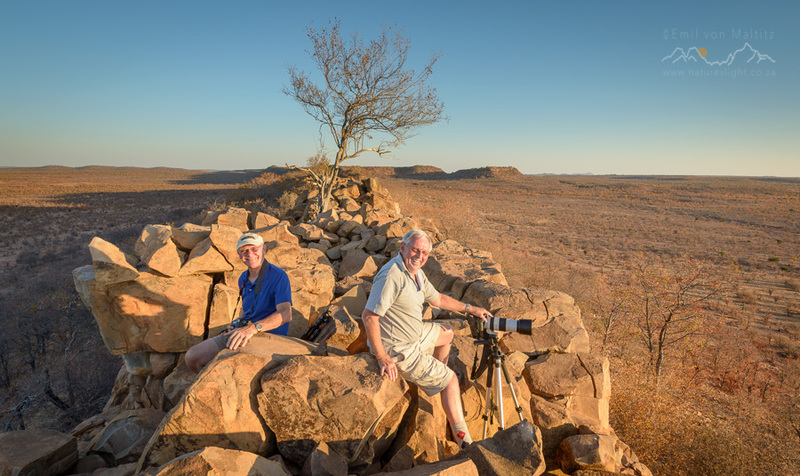 Standing 20 to 30 metres above the rest of the Tuli, the wall runs as a straight ridge for several hundred metres, before coalescing with the range of hills that transect the Tuli Block. Climbing to the top is relatively easy, if a little precarious. The narrow band at the top still allows at least 4 photographers - sometimes taking turns admittedly - to craft their compositions. As it was, I was also testing a Sirui levelling base provided by Sunshinephoto in Cape Town, which also made the crafting panoramic that much easier (more on this in an upcoming article and review of the Sirui LE-60 levelling base). In the end our time in the Tuli Block was divided between the comforts of Serolo Camp near the banks of the Limpopo River, and Mohave Camp on the banks of one of the Motloutse River’s tributaries. The former enjoys the comforts of any private tented camp, with electricity and hot water and round the clock service. However, Mohave is special. Here, away from electricity and any sounds of civilisation at all (not even a road) we were able to become truly absorbed in photography…and relax at the same time. Staying at Mohave camp is an experience in and of itself and one which I thoroughly recommend. A photography workshop tends to be something where the participants are thrown into photographic journey where they eat, think, sleep and breath photography. Workshops can be exhausting, but they also need to be fun. I think and hope that the photographers who joined me in the Tuli Block this year enjoyed their time under the stars and chasing the light. Certainly by the roars of laughter, evenings around the fire, philosophical discussions as we covered the long kilometres from Johannesburg to Botswana and back and the intensity of concentration as we made compositions of…everything, indicates that ‘Romancing The Trees’. I’m looking forward to going back in 2017! Many thanks to Mick, Tony and Roy who joined me this year and made it truly spectacular trip.